McLaren was founded back in the early 1960s by New Zealander Bruce McLaren, who won his first Formula One race at age 22. The brand’s road car relaunch, which began earlier this decade, is now in full bloom, and the gilded lily in the bouquet is the all-new Super Series vehicle, the 720S. The car is exquisitely engineered to promote weight savings. A carbon fibre passenger compartment – made of a bonded polymer that is stronger and lighter than steel – helps accomplish this. There is also an intense focus on aerodynamic flow. Novel integrated air pathways that pass through the headlamp surrounds, through the double-layered door skins and around the windows keep the car from overheating or becoming airborne as it approaches terminal velocity. And a new iteration of the brand’s light and tight, mid-ship mounted, twin-turbocharged V8 engine, now outputting more than 700hp, makes quick work of acceleration. All of this results in explosive and intensely stable performance, even at triple-digit speeds. The car looks amazing: at once wild and restrained, alive and sculptural. But it may be the interior that wins “most improved” status for the brand. Previous McLarens sacrificed luxury on the altar of speed, but consumers at this level now demand more. The interior of the 720S takes a high-minimalist approach to luxury, with exquisitely crafted materials: knurled magnesium knobs, French-stitched leather, and a big tablet-like touchscreen in the centre console. Our favourite feature is the trick dashboard display. In normal use – if such a thing can be said of an exotic supercar like this – the instrument panel sits upright in its typical arched surround behind the steering wheel, displaying speed and engine rpm gauges. But when you put the car into Track mode, the binnacle folds flat, showing just a slender digital speed and rev display, and allowing a more expansive view out. 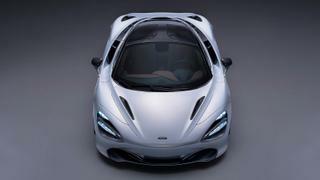 McLaren has promised that it will grant us a convertible version of the 720S. Now that contemporary drop-tops bring all of the pleasure and none of the compromise, we might be inclined to wait until it arrives next year. Or why wait? Get both.